Looking for something to do in the evening, my family and I attended a movie night at Acme Bowl. The movie night included a free bag of popcorn, and 2 hours of unlimited bowling, for only $10 per person. Every Thursday is a movie night at ACME, and on this night, we saw the Penguins of Madagascar. It was super funny! You may be wondering how they show the movie and bowling at the same time. Well they put down these screens over the lanes and you can simply watch it while you play. The movie night went on from 6-8 and we bowled several games. There were also pool tables and arcade games for your enjoyment. We wanted to get something for dinner instead of going out again and the bowling alley had a great selection of food you can choose from at a very good price. We got a huge plate of nachos, called The BIG Lebowski it was worth it. It fed all of us. We also got a pound of fries and they were also surprisingly cheap and yummy. 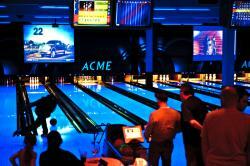 Overall, my experience at Acme bowl was really fun, cheap and awesome. I encourage you to go to Acme with your family, you won&apos;t regret it!